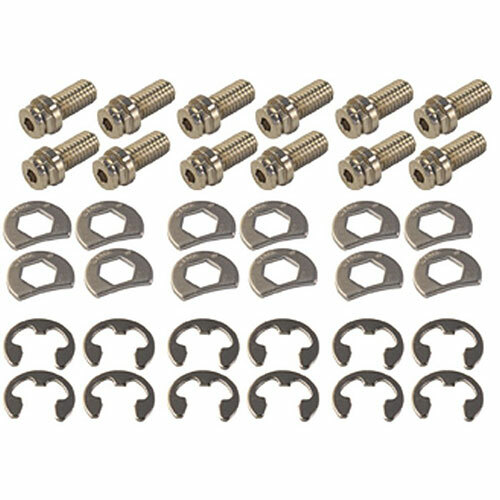 Stage 8 Locking Header Bolts SB-Chevy (12) 3/8-16 x 3/4"
8911 is rated 4.0 out of 5 by 2. Rated 3 out of 5 by mntri5 from Didn't work for me. I bought the 8911 bolts because the description says it's the correct one for my SB 350 chevy. However I think the 8912 kit would have work much better even though the description says it's for BB chevy engines. If you compare the attached photo to the 8911 photo you can see the retainer on the 8912 kit has much smaller increments for locking. I couldn't get the 8911 retainer to work when I tightened the bolts to the proper torque setting. It looks to me like the 8912 would work much better, you just end up with 4 wasted bolts because the 8912 kit has 16 bolts where the 8911 kit has only 12.